Just a few months ago, new construction projects at Bates were transforming a swath of campus that extended from Mount David to Merrill Gym. Now, like a Hollywood crane shot where the camera swoops down from lofty to intimate, the focus of construction at Bates is closing in on the interior of the new dining Commons. Let’s recap. 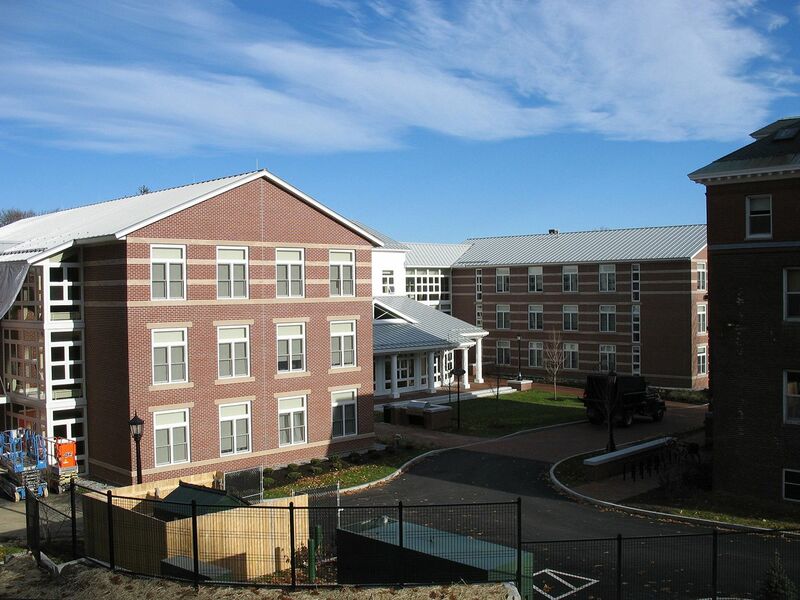 In mid-August, the new student housing at 280 College St. opened for occupancy. The work that was awaiting completion at that point is now all but done, project manager Pam Wichroski said. 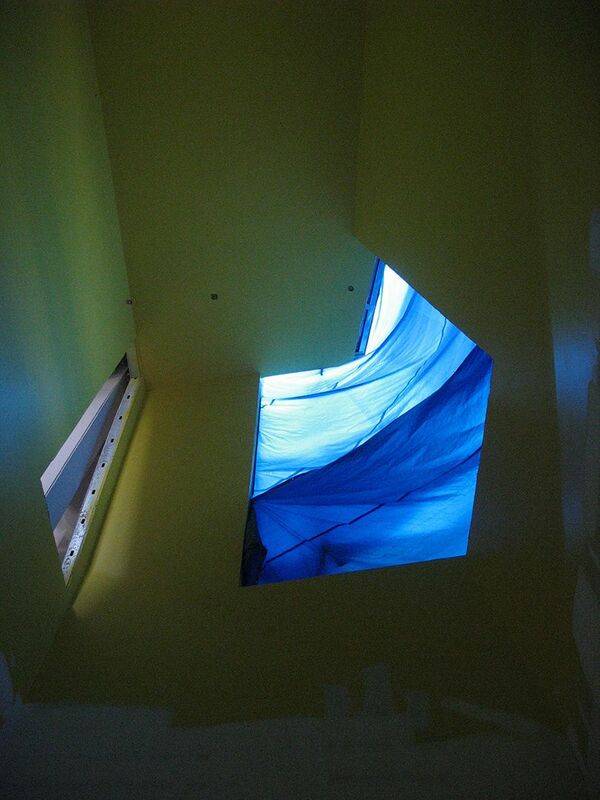 What’s left, besides a few finishing touches on the exterior, is a final sweep of inspecting and correcting details. That “punch-list” process should be polished off during the Christmas break, Wichroski said. And that, for all practical purposes, will be that. Because general contractor H.E. Callahan of Auburn has warranted the project for a year, it’s not impossible that we’ll see workers on the premises again after the current punch list is done, Wichroski noted. Near completion, too, is Alumni Walk. Linking College Street with Central Avenue and 280 College with the new dining Commons, that project occupies two and a half central acres of campus. The area’s importance to cross-campus traffic became abundantly clear during the summer when general contractor Consigli Construction closed off large sections of it. But the last construction fences have come down and the chore list has gotten short. 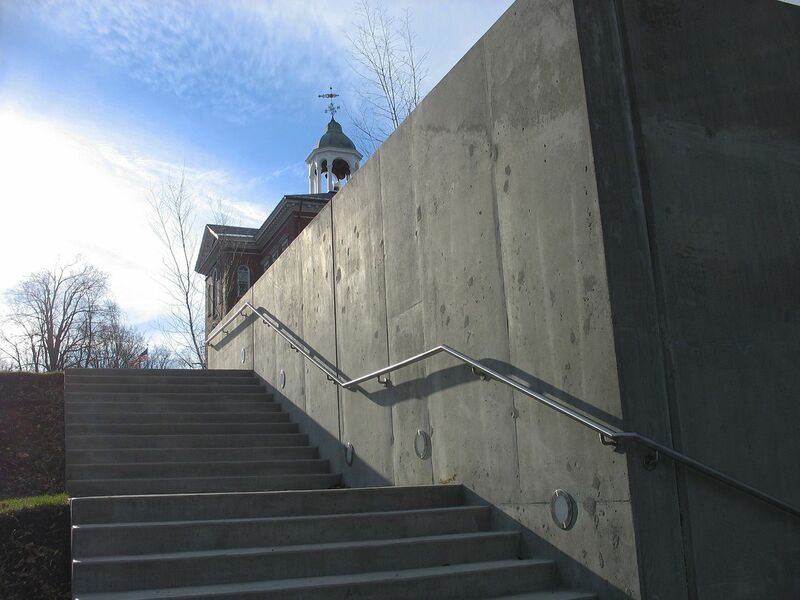 The installation the other week of a handrail along the concrete steps between Lane and Pettengill halls completed one of the Walk’s last prominent pieces, the new amphitheater facing Lake Andrews. All that remains for major work on the walk is the placement of two granite installations. One of them, 12 feet long and bearing the words “Bates College,” will be set at the College Street entrance of the walk. Near Pettengill Hall, a 20-foot piece will recognize the role played by Jack ’59 and Beverly Keigwin P’86 in making the walk possible as a tribute to generations of Bates alumni. Each installation will consist of several two-foot-high chunks of cut black granite lined up on a concrete base. Diagonal gaps between the chunks will mirror the pathways that crisscross Alumni Walk. The foundations have been started, Farnsworth said, and the granite will be put in place in the weeks to come. In other landscaping news, the iron Class of 1910 Gate has been reassembled on its new brick piers. The gate now marks the south access to a plaza around the entrance to the new Commons. Near the gate, serviceberry trees have been planted in the new viewing garden that will soothe any sore eyes that happen to peer from the Commons’ southern windows. A layer of smooth black stones, identical to the ones covering certain roofs visible from inside Commons, will top the crushed rock now blanketing the garden. 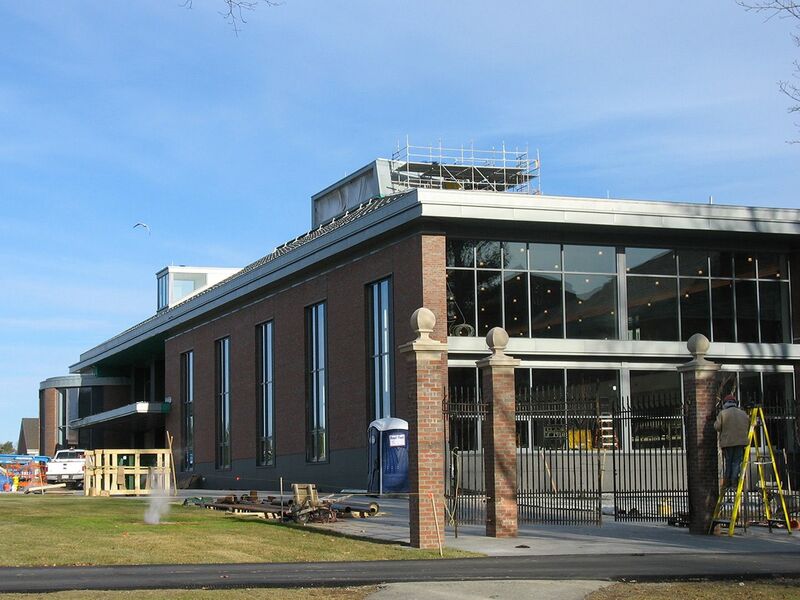 Finally, the new Commons itself: With only a few sheets of window glass yet to be installed, the last major tasks on the exterior are the completion of the ventilation monitor at the building’s peak, and then the installation of slate roofing that’s been waiting for the monitor. Glass for the monitor’s skylight has arrived and a crane will come in to hang it next week, essentially completing that long-awaited step, Farnsworth said. The roofing should be done by Christmas. As noted, most of the action nowadays is inside the Commons. The process of systems-testing called “commissioning” has begun, with local architecture firm Harriman Associates as agent. Farnsworth noted that there are 84 line items on the commissioning list, with some line items covering many examples of a given item. Faucets, for example. A task scheduled for completion this week will simplify the commissioning. Farnsworth expected that the building’s connections to the campus computer net would be established, enabling some systems to be tested remotely. 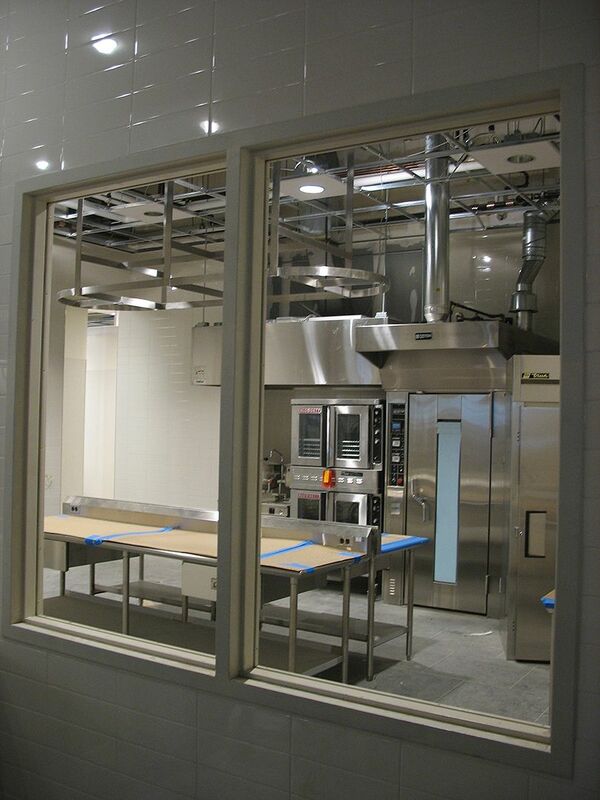 Farnsworth got us going when he mentioned that ceiling installers were “flooding” the kitchen and servery areas. Did they puncture a pipe? Nope: Instead, flooding is the verb the pros use where the rest of us might say that we have hung a big bunch of ceiling tiles. Farnsworth added that this particular expanse of ceiling gets an attractive double-layer treatment, with black tiles suspended above a white grid. 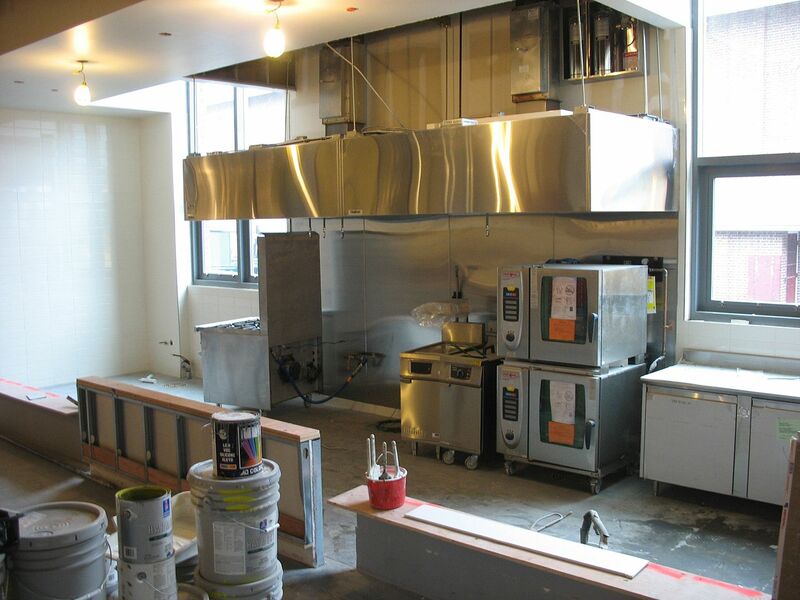 He estimated that three-quarters of the non-portable kitchen equipment was in place. The big push now, he explained, was on countertops and cabinetry. Painting is moving apace, elegant black masabi granite countertops have been installed in the meeting rooms, and granite wall veneers are nearly all in place. Farnsworth went on to paint an alluring picture of this signature space: A walnut-composite floor, maple wall paneling, comfy furniture and floor lamps, and bookshelves that can be moved to serve as “walls” for hanging art. 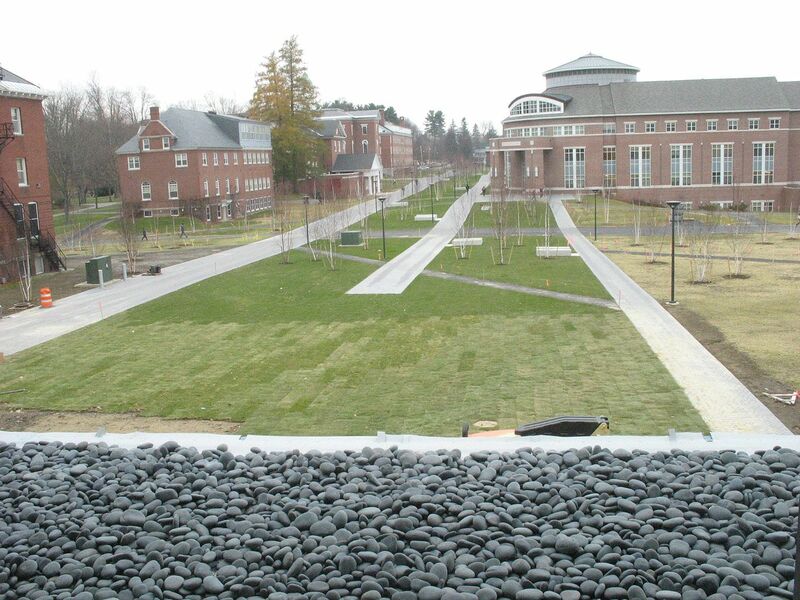 Finally, we’ll return to the great outdoors and the new parking lot just opened behind Merrill Gym. With the city’s winter parking restrictions taking effect Dec. 1, the lot’s 70 spaces have come into service just in the nick of time. 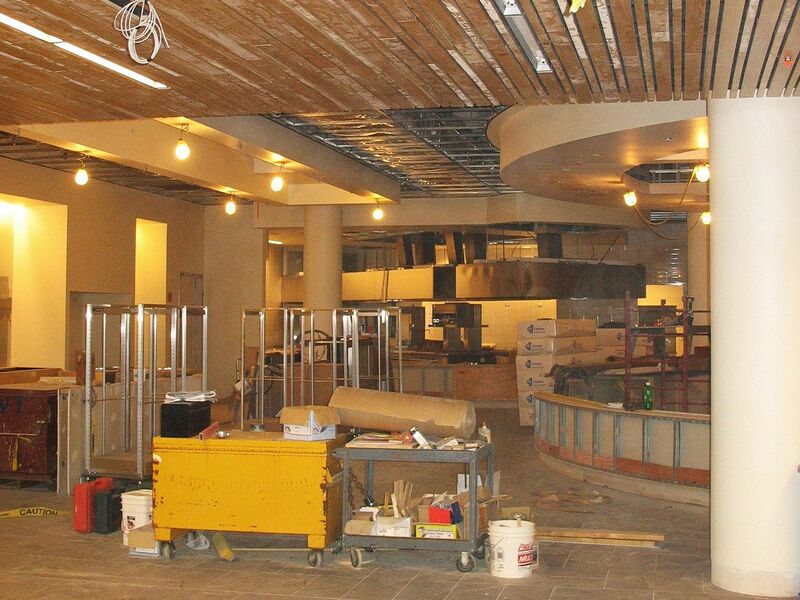 Our back pages: See an index of earlier Campus Construction Updates.